A previous study of the Cypriot pottery collection housed in the Ian Potter Museum of Art at the University of Melbourne found approximately two-thirds of adhesive repairs are primarily composed of cellulose nitrate (CN). This is of concern as CN has a limited lifespan (6–20 years), which has implications for the strategic management of the collection. To gain a greater understanding of the prevalence of CN based adhesive repairs in the archaeological context, the original FTIR-ATR spectroscopic survey was extended to incorporate the University’s Middle Eastern archaeological pottery collection. Micro-samples were removed from artefacts using acetone swabs. Analysis of adhesive FTIR spectra identified CN to be present not only as the primary polymer in approximately one-tenth of repairs, but also as a secondary polymer in poly(vinyl acetate) (PVAc) and acrylic adhesive formulations, observed as a weak peak at ~1656 cm−1. CN’s secondary presence in PVAc adhesive formulations is demonstrated using principal component analysis (PCA) and the diphenylamine spot test for CN. Re-analysis of adhesive IR spectra from the Cypriot pottery collection found CN to be present as a secondary polymer in this collection as well. It is concluded a combined methodology of collecting and identifying FTIR-ATR spectra of adhesive repairs from archaeological pottery collections followed by PCA analysis bring to light adhesive formulations which can inform the management of pottery collections. Cellulose nitrate (CN) was commercially introduced in the 1870s [1–3] and has been widely used in objects, film, coatings and adhesives [4–7]. It is manufactured via controlled acid catalyzed nitration of cellulose using nitric acid and usually sulphuric acid [7–9]. When fully tri-nitrated, it was used as an explosive called ‘gun cotton’. A more stable product resulted from the less completely di-nitrated substance . Subsequent washing with water aimed to set the level of nitration and remove all acid residues . To avoid a less stable product, it was found to be important to repeatedly wash the acidified cotton to ensure removal of all unreacted acid [7–9, 11, 12]. To overcome its brittleness, stiffness and tendency to shrink, plasticizers were employed to soften the polymer [1–3]. Over the past century it has been progressively plasticized with less volatile materials shifting from the use of oils and camphor (which volatilize rapidly causing polymer shrinkage), to phosphates and phthalates (which are less volatile) [4, 7, 8]. However non-volatile plasticizers like dibutyl phthalate (DBP) may migrate into adjacent porous material, again resulting in shrinkage of the polymer . Plasticized di-nitrated CN found numerous applications  due to its ability to be molded into three-dimensional objects and dry to a thin transparent film. CN based artefacts can be found in a variety of collections worldwide, such as modern materials and technology through to ethnographic and ancient archeological collections. It was introduced to conservation for use as an adhesive, consolidant and coating in 1899 . It has been particularly popular as an adhesive for reassembling archaeological earthenware vessels [14, 15] due to its ease of use and high glass transition temperature (Tg) of ~50 °C. As researchers became aware of CN’s inherent stability issues, concerns were raised about its use in the conservation context [4, 16–19]. It is susceptible to oxidative and hydrolytic decomposition via acid catalysis, heat and ultraviolet (UV) radiation, which can become autocatalytic [8, 9, 12, 18, 20]. An associated reduction in molecular weight causes the polymer to yellow and become brittle. Nitric oxides are produced which combine with water to form acids such as nitric acid (HNO3). These acids can initiate degradation within the polymer itself and in neighbouring artefacts, of which organic and metal-based materials are particularly susceptible [7, 9, 19, 21]. Plasticized CN has a slower rate of decomposition than the pure CN polymer . As outlined above degradation is facilitated by plasticizer migration and the presence of acid residues from original manufacture. The rate of degradation is reduced in an open ventilated system and accelerated in a closed system (as acid concentrations increase) . In archaeological earthenware, physical failure of the aged polymer results in breakage at the join and/or in the adjacent ceramic fabric [8, 22]. Fourier transform infrared (FTIR) spectroscopy using an attenuated total reflection (ATR) accessory is a valuable tool for identifying synthetic polymers in museum collections . FTIR spectroscopy is a polymer identification tool of increasing interest to institutions, as technological advances make its use more accessible. It is a minimally invasive technique, via which polymer families can be accurately identified. This information has the potential to aid the conservation management of polymers in collection contexts and inform broader conservation and/or collection management practices . Archaeological collections present a unique opportunity for studying the ageing behavior of CN due to its use as an adhesive in the archeological context for more than a 100 years . As a non-original material, it provides access to real time aged CN samples, which unlike significant museum objects can undergo sampling and analysis. Such samples provide a context from which to historically study adhesives, adhesive formulation and polymer degradation and to map changes in conservation practice in the selection and application of these materials. A FTIR-ATR spectroscopic identification survey of adhesives in the Cypriot pottery collection by Nel et al. found approximately two-thirds of repairs are composed of CN. It is identified by the characteristic IR peaks of the nitrate group, observed as asymmetric and symmetric stretches at approximately 1634 and 1278 cm−1 respectively [25, 26]. A smaller peak due to the carbonyl group of the plasticizer is observed at 1728 cm−1. Plasticizers can be identified using gas chromatography with mass spectroscopy (GC–MS) [6, 27]. Housed at the Ian Potter Museum of Art (Melbourne, Australia), the University of Melbourne’s Middle Eastern collection is described as being largely the result of unstructured collecting efforts by staff. It was shaped by specific teaching and research interests  with limited records as to when or how many of these items were acquired. Comprised of approximately 800 artefacts, the collection includes manuscripts, pottery, bronzes, coins and plaster casts, of which 466 are ceramic artefacts. These pottery artefacts are primarily from the Bronze (Fig. 1) and Iron ages, with some assemblages being from known sites in Palestine and Jordan. As summarized in Table 1, 278 pottery vessels are known to have been excavated and acquired across six accession periods: 1991 (Susa); 1978 (Babedh Dhra, Jordan); 1975 (Arad and Tell Sheva, Palestine); 1970 (Jerusalem and Tell Michal, Palestine), 1968 (Egypt) and 1960 (Tell Michal and Jericho, Palestine). The remaining 188 have no accession period noted (as indicated by 0000.XXXX accession numbers) but are associated with find spots in Jordon, India, Assyria, Egypt, Palestine and other unknown locations. 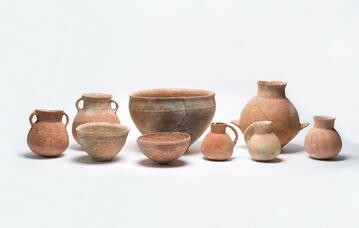 Nine ceramic vessels, Jordan, Dead Sea Plain, Bab edh-Dhra, Cemetery A, Tomb A 72 South, Early Bronze Age (EB IA), c. 3100 BCE, The University of Melbourne Art Collection. Similarly the University of Melbourne’s Cypriot pottery collection also consists of primarily Bronze and Iron Age artefacts. These were excavated and acquired in Cyprus in the 1930s and 1960s and transported to Australia primarily by University of Sydney archaeologist Professor JR Stewart [29, 30]. This collection was acquired by The University of Melbourne over two accession periods: in 1972 for its official sponsorship of excavation activities [24, 31]; and subsequently, with the 1987 purchase of over 200 objects from the Australian Institute of Archaeology, supplementing and enhancing the existing sequence of material culture . As previously described the collection of 382 objects includes approximately 350 ceramic artefacts . As summarized in Table 2, artefacts were primarily excavated from known sites: the first 1972 acquisition comprises excavations from Ayai Paraskevi (1955–1956), Lapatsa and Palealona (1960–1961) and the second 1987 acquisition consists of Vounous (1937–1938) and Stephania (1951). A further eight were excavated at minor sites (Sphageion, Ayios Iakovo, Pano Dikomo, and Rizokarpas) and the provenance for the remaining items are unknown  as denoted by 0000.XXXX accession numbers. Previously 143 (37%) of the 384 pottery vessels in the Cypriot pottery collection were found by Nel et al. , to contain adhesive repairs. Reconstructed vessels were identified to contain the following adhesives: 112 (61%) CN, 41 (22%) PVAc, 2 (1%) protein, 2 (1%) acrylic, 4 (2%) acrylic + CN, 6 (3%) polystyrene (PS) and other 16 (9%) spread across 9 excavation sites (Table 2). It has been demonstrated with the Cypriot pottery collection investigations that unambiguous identification of adhesives types can aid: the strategic targeted treatment of a vessel  and with developing prioritized management strategies for a collection [24, 34]. An FTIR-ATR spectroscopic adhesive identification survey was conducted on the Middle Eastern pottery collection to qualify the findings of the Cypriot collection survey. From the results, a picture can be built of the extent of CN’s use as an adhesive in archaeological collections, and how this varies between different collections. In addition its potential presence in other adhesive formulations  and real time ageing characteristics can be further explored. There is a focus on earthenware pottery as a significant amount of these objects are excavated as damaged vessels or sherds, which are then repaired with adhesive for interpretation purposes. As a non-original material, it is ethically acceptable to remove adhesive samples for analysis purposes. Commercially available reference products were procured  as adhesive controls (Table 3). CN based adhesives include HMG Heat and Waterproof (H Marcel and Guest) and UHU Hart (UHU). Acrylic based adhesives comprise Acryloid B-48N (Conservation Materials Ltd.), Paraloid B72 (Archival Survival), Paraloid B67 (Conservation Materials Ltd.), and HMG B72 acrylic adhesive (H Marcel Guest). CN has been identified in the HMG B72 acrylic formulation . PVAc based adhesives consist of AYAF-PVAc (Conservation Materials Ltd.), Aquadhere PVA wood glue (Selleys) and UHU All Purpose (UHU). UHU All Purpose is known to contain some CN . Protein based glues include: Gelatin (Asia Pacific Africa), Fish Glue (Lee Valley) and Rabbit Skin Glue (Talas). Easily accessible excess adhesive extruding from or smeared across joins on the vessel surface during past reconstruction were targeted for sampling. Adhesive material was visibly glossy in appearance in contrast to the matt earthenware fabric. It presents as beads, bubbles or surface films, non-uniform in quantity and thickness. In some instances, failing adhesives were observed to have stretched and pulled across the fabric (Fig. 2). 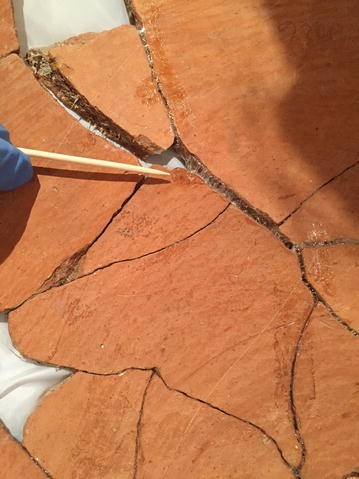 To reduce the risk of damaging original archaeological material and minimize the amount of material removed, a micro adhesive sample was collected from each pottery vessel using an acetone-dampened swab. Acetone was selected based on the known solubility profiles of CN, PVAc and acrylic . Before significant solvent evaporation could occur, the resin was immediately transferred from the swab to the diamond window of the portable FTIR-ATR spectrophotometer. Following acetone evaporation an FTIR spectrum was obtained of the thin polymer film that had formed on the diamond window. Adhesive remaining on the swab was stored in a sealed glass vial for future GC-MS analysis, which aims to identify the plasticizer(s) in each sample. A total of 148 samples were collected from the 127 pottery vessels containing repairs. Example of adhesive failure, s1342, identified via FTIR-ATR spectroscopy as containing primarily PVAc + CN as a secondary polymer. Vessel 1970.0478, Palestine, Jerusalem Cave 1, The University of Melbourne Middle Eastern collection. A subset of vessels were selected from the Middle Eastern collection for chemical spot testing, based on: their availability (not on exhibition) and the presence of a significant amount of adhesive material, which was easily accessible. Twelve (0000.0352, 1960.0021, 1970.0331, 1970.0334, 1970.0440, 1970.0446, 1970.0449, 1970.0453, 1970.0456, 1970.0458, 1970.0474 and 1970.0478) were identified via FTIR-ATR spectroscopic analysis to contain PVAc (7) or PVAc + CN (5). Three (1970.0466, 1970.0335 and 0000.0339) were identified to contain acrylic (2) or acrylic + CN (1). Using the methodology developed by Nel et al. for the Cypriot collection, a comprehensive list of Middle Eastern collection items was compiled from the online Classics and Archaeology Virtual Museum. Pottery artefacts were then visually assessed in situ in the collections store to identify those containing adhesive join repairs, and determine the level of accessibility for sampling. IR spectra were collected using a portable Bruker Alpha-P FTIR spectrophotometer equipped with a diamond ATR window (Bruker Optik GmbH, Ettlingen, Germany) and OPUS v 6.5 software. Prior to the spectral collection of each sample, the diamond ATR crystal was cleaned with isopropanol, checked by a software cleanness test, and a background spectrum recorded. As outlined by Nel et al. all spectra were recorded in the spectral range of 4000–375 cm−1 with 32 co-added scans at a spectral resolution of 4 cm−1. For each sample, an overall photo of the vessel, a detail photo of the sample removal site, the adhesive colour, form (bubble or thin film) and an FTIR-ATR spectrum were recorded (for an example see Fig. 3). Vessel 1978.0161 (overall and detail of adhesive sample location analysed) and associated sample IR spectrum (s1374) identified to be CN based on match with control adhesive reference database. The OPUS software ‘quick compare’ function (based on percentage spectral correlation) provided matches for the primary polymer in each sample using the in-house reference database of authentic adhesive samples. These control samples of adhesives commonly used on archaeological pottery contain characteristic diagnostic infrared bands, highlighted in Figs. 4, 5 and Table 4. Comparison of the highest percentage match with the sample spectrum was used to visually verify each polymer identified. PCA is a multivariate statistical data analysis technique used to reduce the complexity of, and to aid in, the interpretation of large data sets [24, 34]. PCA represents a complex multi-dimensional data set as a number of dimensions or principal components (PC). PCA was conducted on all IR spectra obtained from the ME collection survey, identified to contain PVAc as its primary polymer, using “The Unscrambler’’, v 10.0 (CAMO ASA, Oslo, Norway) software. Before proceeding with the analysis, original IR spectra (4000–375 cm−1) were truncated to 2000–700 cm−1 in order to exclude areas containing systematic noise or insignificant spectral information. Regions of interest include the double bond functional group region 2000–1500 cm−1 (C=C and C=O) and the fingerprint region 1500–600 cm−1 , where key differentiating peak assignments for CN, PVAc, acrylic and protein are prominent . Excluded areas comprise: bands due to C–H (3100–2850 cm−1) and O–H (3700–3600 cm−1)/N–H (3400–3300 cm−1) stretches  which are not diagnostic; the triple bond functional group region (2500–2000 cm−1) where there is an absence of bands  and extraneous bands due to water vapour (4000–3000 cm−1) and carbon dioxide gas (2340 cm−1) . Pre-treatment of IR spectra was explored. Data underwent baseline correction, normalization, Savitzky Golay smoothing and first and second derivatization (GAP and Savitzky Golay). Overall these pre-treatments did not improve separation of the data. Due to the broadness of the nitrate band of CN at low concentrations (see Figs. 4, 5), a second derivative transformation was found to be ineffective, as it generally enhances sharp peaks at the expense of broader bands . Therefore PCA is reported for the untreated IR spectra. Each PC indicates spectral variance in decreasing amounts within the data set. The first principal component has the largest possible variance (i.e. accounts for most of variability in the data as possible). Each succeeding component has in turn the next highest possible variance. Component scores indicate the amount of variance explained by each PC. A scores plot is used to visually represent the relationship or amount of variance (similarities and differences) between samples. It is a scatter plot of two PCs, which may separate out into different clusters. Each cluster contains a highly similar group of samples with minimal variance. Scores plots were examined to identify separation between adhesives composed of a primary polymer (PVAc or acrylic) and those where a secondary polymer (CN) is also present. Loadings plots calculated for each PC, indicate the degree to which each wavenumber contributes to the variance represented or explained by that particular PC. Loading plots were overlayed onto the reference IR spectra of CN and PVAc to identify correlation between areas of positive or negative deviation and the diagnostic IR peaks of PVAc (1729, 1225 and 1018 cm−1) and CN (~1645, 1280 and 840 cm−1), highlighted in Figs. 4, 5. Commercial adhesive controls, and samples from the PVAc and acrylic subsets were tested for the presence of CN and protein using the diphenylamine and Biuret tests respectively . Samples were removed as per the collection survey methodology, using acetone soaked swabs, to which the spot test solutions were directly applied. Acetone swabs of control samples known to contain CN, tested positive for CN using the diphenylamine test. Other adhesive controls (PVAc, acrylic and protein) tested negative for CN. Water swabs of the three control protein samples tested positive for protein. Acetone swabs of all the control adhesive samples tested negative for the Biuret (protein test). Of the 466 ceramic vessels in the ME collection, 127 (27%) were found to have adhesive repairs (see Table 1). These are spread across seven accession periods. Where accessible, adhesive samples were removed for FTIR-ATR spectroscopic analysis. If an adhesive repair appeared visually different from another on the same vessel, then a second or third sample would be removed for spectroscopic analysis, to confirm if this was a different polymer. FTIR-ATR spectroscopy results found 117 (92%) of reconstructed artefacts contain one adhesive type, and 10 (8%) two or more. In contrast, the Cypriot collection is spread over two accession periods and of 303 pottery vessels, 146 (48%) have adhesive join repairs. Of the 142 vessels for which adhesives could be spectroscopically analysed, 120 (84%) contained one adhesive type and 22 (16%) two or more. Adhesives identified in the objects tested were: PVAc (48, 75%); CN (15, 12%); acrylic (6, 5%); PS (2, 2%), and the remaining samples (30, 24%) were found to be other or unidentifiable (x) (Table 1). Unidentifiable samples (x) were either not accessible due to: the neatness of joins; poor quality spectra; or for example a protein-based glue that is either water-soluble or no longer water soluble when aged. Identification of non-synthetic polymers (such as protein) was not undertaken for this paper. CN was found to be the major polymer in small quantities across the 1978, 1970, 1960 and non-dated (0000) accession periods, as shown in Fig. 6. Visually it was noted CN samples are either clear, or yellowed in appearance. Severe yellowing indicates photochemical degradation initiated by light exposure, which continues even after being removed from the light source . However CN generally can have a slight yellow tint  as observed with the control reference adhesive samples. Within the PVAc sample set, two types of spectra were differentiated: PVAc and PVAc and a peak at ~1656 cm−1 (see Fig. 7). This is most likely due to the NO2 symmetric stretch of CN as observed for the IR spectrum of control UHU All Purpose, which is known to contain PVAc + CN  (Figs. 4f, 5 and Table 4). It could also be due to the amide stretch of a protein (Fig. 4d, 5 and Table 4). Of the 121 PVAc adhesive samples, 69 (57%) contain the peak at ~1656 cm−1. Visually both types of PVAc samples appear either clear or milky white. To aid identification of the peak at ~1656 cm−1, chemical spot testing was applied to samples obtained from 12 artefacts in the ME Collection. Samples from five vessels identified as PVAc with a peak at ~1656 cm−1 tested positive for CN. Seven samples from vessels containing PVAc without the peak at 1656 cm−1, tested negative for CN. All samples tested negative for protein. PCA was calculated for all 121 PVAc based IR spectra obtained from the ME collection: PVAc (52) and PVAc + CN (69). The majority of variance was represented by PC1 (95%), PC2 (3%), PC3 (1%) and PC4 (0.3%). No significant distinctions were found in the scores plots (not shown) with the exception of PC1 versus PC4, where partial separation occurs for the PVAc and PVAc + CN samples (see Fig. 8). Highest correlation was found between the loading plots of: PC1 (Fig. 9a) and PVAc’s diagnostic peaks at 1729, 1225, 1018 cm−1; and PC4 (Fig. 9b) and CN’s peaks at ~1645, 1280, and 840 cm−1. Further examination of six acrylic IR spectra revealed two sub-groups: acrylic (4) and acrylic + CN (2). A small peak (~1656 cm−1) was identified in addition to the strong characteristic acrylic carbonyl peak at ~1740 cm−1. As with the PVAc samples, the peak at ~1656 cm−1 is most likely due to the NO2 symmetric stretch of CN  or alternatively the amide stretch of a protein based adhesive. Visually adhesive samples were clear and colourless. Of five samples spot tested, samples identified to contain acrylic + CN tested positive for CN. The four acrylic samples tested negative for CN. All samples tested negative for protein. PCA analysis was not conducted on acrylic samples due to the small quantity of samples and IR spectra available. Based on these findings from the ME collection it was determined to be worthwhile to re-analyse the PVAc and acrylic spectra obtained from the Cypriot pottery collection. A further analysis of the PVAc and acrylic IR spectra from the Cypriot pottery collection, found 40 (98%) of PVAc samples and 4 (67%) of acrylic samples contain the peak at ~1656 cm−1, due to CN (Table 2). In summary, CN is present in adhesive repairs as a primary component (61% Cypriot and 10% ME collections), and as a secondary component of (a) PVAc repairs (24% Cypriot and 32% ME collections) and (b) acrylic repairs (2% Cypriot and 1% ME collection) (Fig. 10a, b). In total CN is present in 87% and 43% of the Cypriot and the Middle Eastern pottery collections respectively. Previous research  analysed six different primary adhesive families in the Cypriot pottery collection. It was found PVAc and CN are inversely correlated in the scores plot of PC1 and PC2. The loadings plot of PC1 was found to have a significant positive and negative loadings corresponding with the main spectral bands for PVAc (1736 and 1234 cm−1) and CN (1653 and 1277 cm−1) respectively . A reanalysis of the IR spectra of CN  found that a scores plot of PC3 versus PC4 separates the CN samples into two distinct groups correlating with the two accession periods of the collection. The loadings plot of PC4 had significant negative loadings corresponding to the plasticizer DBP. This demonstrates that in addition to PCA being able to differentiate between different polymer families, it can also pick up subtle difference in formulation when focusing on one particular polymer family. A focused reanalysis of the IR spectra of 92 PVAc based samples from the ME collection found that a scores plot of PC1 vs PC4 (Fig. 8), partially separates PVAc and PVAc + CN (with 1656 cm−1 peak) samples. Subsequently correlation was found between the loading plots for PC1 and PC4 with the IR peaks of PVAc (1729, 1225, 1018 cm−1) and CN (1638, 1272, 822 cm−1) respectively, supporting the presence of CN in PVAc formulations containing a peak at 1656 cm−1. Chemical spot testing of controls and adhesive samples obtained from 12 PVAc and 5 acrylic repaired objects, confirmed the presence of CN and found no evidence of protein. It is well known CN based products were historically plasticized using camphor, phthalates and/or other plasticizers and additives . Camphor and DBP have a characteristic carbonyl peak at 1738 and 1720 cm−1 respectively, which are located at a slightly higher energy than the nitrate peak of CN at ~1656 cm−1. PVAc is also reported to contain plasticizers such as DBP . As a consequence it is likely the presence of plasticizers may explain why only partial separation was achieved for the scores plot of the PVAc data set. It is known that PVAc based adhesives may contain CN within the formulation (for instance UHU All Purpose) [36, 41]. When CN is present within a PVAc based formulation, this may compromise its ageing as determined by Down et al. , where the commercial product UHU All Purpose, initially performs well but later dramatically deteriorates in performance with ageing. A PVAc + CN formulation may have been applied to the vessels when additional repairs were made using UHU All Purpose before photographing artefacts for the virtual museum project in 1996. Alternatively, this formulation may have been applied at the relevant excavation site or when conserved, as UHU All Purpose is one of the longest used and most widely accessible adhesives across the globe . In the case of acrylic + CN, Nel and Lau  detected CN in the acrylic B72 adhesive formulation manufactured by HMG . Inclusion of CN in the HMG B72 acrylic formulation occurred in May 1995, as confirmed by the manufacturer . This transpired more than 21 years ago and a period of 13 years passed before CN’s incorporation into the formulation was revealed . Normally considered a conservation grade material , this formulation change is an example of how acrylic + CN may be found together within an adhesive in the archaeological conservation context. There is a significant difference in the presence of CN within the two collections compared. CN was identified in the majority of vessels as the primary polymer in the Cypriot collection. However within the ME collection CN is less frequently used as the primary adhesive, and much more frequently used as an additional resin in PVAc formulations. As reported by Nel et al. the presence of CN in the Cypriot collection is clustered as two identifiably different formulations correlating with two bulk accession periods. Whereas the ME collection has seven accession periods. Adhesive types are broadly spread both across and within the ME collection accession groups (Table 1). These differences may be attributable to a variety of acquisition approaches. The ME collection acquisition process was significantly unstructured, resulting in a broader range of object provenance and pathways into the University’s collection. As a result of the FTIR spectroscopic surveys, adhesive repairs (Fig. 10) within the Middle Eastern and Cypriot collections are determined to comprise CN as: the primary polymer or as a secondary polymer within a primarily PVAc or acrylic formulation. CN may be present as a minor component due to: its purposeful presence in the original adhesive formulation to modify its working properties (e.g. increase Tg); or due to the application of multiple adhesives within the one join. As a consequence it is important to identify the presence of CN (via the minor peak in the IR spectrum), so vessels requiring more urgent conservation than would be anticipated for the parent polymer are identified and prioritised. A 27 year long ageing research project conducted into PVAc and acrylic adhesives by Down  at the Canadian Conservation Institute (CCI), initially found UHU All Purpose (composed of PVAc and CN) to be relatively stable. However, a follow up study found a dramatic deterioration in its performance . Confirmation of CN’s possible presence in an acrylic formulation , suggests the impact of CN on acrylic performance needs to be further explored. A comparative accelerated ageing study of adhesives, where CN is present as a primary and as a secondary polymer is required to determine which formulations need to be prioritized over the other. Archaeological pottery collections provide an opportunity for investigating the natural ageing of PVAc and acrylic products containing CN. Findings from this context indicate further case studies may help identify whether this methodology is applicable to other polymer mixtures, which contain CN. Without a portable FTIR-ATR spectrophotometer, a survey of this scale and detail within a museum context may not have been possible, and the identification of CN in the PVAc and acrylic samples unlikely. This investigation demonstrates the value of this tool for collecting institutions. Future research will involve closer interrogation of samples containing CN in the context of acquisition date and location of find to identify how CN may have been used in archaeological practice. GC–MS analysis of the ME collection will be conducted to identify plasticizers used in adhesives where CN is present as a primary or secondary polymer, providing further insight into adhesive formulations. This can be compared and contrasted with findings for the Cypriot pottery collection, where the CN data separated into two DBP plasticizer formulations associated with the two accession periods . CN was found spread across the acquisition periods of the Middle Eastern collection. Although found in small quantities, it is present within the collection as major or a minor component of adhesive formulations. Either way, identification of the presence of CN can be used to inform collection management priorities. These results further qualify the findings of Nel et al. for the Cypriot pottery collection survey and highlights that CN may be found in unexpected locations within museum collections. With the absence of treatment records, conservators are reliant in this context on scientific analysis for adhesive identification. Archeological collections provide an opportunity for studying and analyzing real life examples of aged CN, collection of spectra, enabling exploration of patterns of material use without damaging or removing original material from artefacts. This data set provides an opportunity for comparing the ageing characteristics of adhesives primarily consisting of CN and with those containing CN as a secondary component within a formulation. Surveys of other collection types are required to gain a thorough understanding of the potential extent of CN in collections. It is evident portable FTIR-ATR spectroscopy is an effective method for identifying polymers in collections, and is enhanced when combined with PCA for identifying a minor component like CN that may compromise adhesive performance. Where accessible, FTIR-ATR spectroscopy followed by PCA will ultimately prove useful for developing conservation management strategies, across a variety of collection types. PN, DL and EN initiated project, collected data (EN under the supervision of PN and DL), analysed data and contextualized results. All authors contributed to the final manuscript. All authors read and approved the final manuscript. This research was undertaken as part of a collaborative project between the Grimwade Centre for Cultural Material Conservation at the University of Melbourne and Museum Victoria, with funding from the McCoy Project Seed Funding Scheme and through the Australian Government Research Training Program Scholarship. The authors acknowledge the contribution of the McCoy project team from: Museum Victoria (Maryanne McCubbin, Helen Privett, Dr Rosemary Goodall) and the University of Melbourne (Dr Alex Duan, Dr Augustine Doronila, Dr Andrew Jamieson, Assoc Prof Alison Inglis). Research assistants, Tim Ould and Kristine Allinson assisted with surveying the ME collection. The Ian Potter Museum of Art at the University of Melbourne provided access to the ME pottery collection. Data and materials are not currently available as they are part of an ongoing project. Jamieson A. Cypriot antiquities. The University of Melbourne. 2007. http://www.art-museum.unimelb.edu.au/exhibitions/past-exhibitions/fromyear/2002/toyear/2013/exhib-date/2007-09-05/exhib/cypriot-antiquities. Accessed 18 Feb 2013. UHU Adhesives. CAMEO: conservation & art material encyclopedia online. Museum of Fine Arts; 2000. Updated 10 May 2016. http://cameo.mfa.org/wiki/UHU_adhesives. Accessed 17 Nov 2016. UHU GmbH & Co KG. Company history: a leading adhesive for over 80 years’. UHU.com. 2016. http://www.uhu.com/en/information/about-uhu/company-history.html. Accessed 9 Aug 2016.